The Australian Healthy Ageing Organisation supports various areas of research, including ways that quality of life can be improved in ageing, the prevention of chronic illness, and increasing public awareness of earlier life choices that can impact on health in later life. Brain changes associated with cognitive impairment can occur many years prior to noticeable symptoms of the impairment. However few studies have examined the relationship between brain volume changes and cognition over a long-term period. This study examined such changes in a group of older Australian women. The findings indicate that reduction rates in brain volume are associated with a reduction in memory performance over 10 years. The authors also reported that grey matter volume at baseline was a predictor of executive function performance over 10 years. The Mediterranean diet has been indicated as protective of the brain, but few studies have considered the impact of Mediterranean diet adherence on beta-amyloid, the hallmark protein of Alzheimer's disease. This study investigated the potential association, finding no association in a cohort of older Australian women. Vitamin D deficiency has been associated with cognitive decline and dementia in older adults. However, there is a paucity of studies assessing whether this association manifests from midlife. Given the long prodromal stage of dementia, we investigated the association between midlife vitamin D and cognition 10 years later. The results of the study indicated that midlife vitamin D > 25nmol/L is associated with improved aspects of executive function in ageing. Findings highlight a potential therapeutic age window where midlife vitamin D repletion could be neuroprotective against cognitive decline. The use of Hormone Replacement Therapy (HRT) in older women has been associated with increased risk of coronary heart disease and stroke. Risk may be ameliorated by timing of initiating and length of exposure to HRT, yet evidence remains equivocal. The aim of this study was to observe whether use of and length of exposure to HRT elevates cardiovascular risk (CVR) in older, post-menopausal Australian women. The results found that current HRT use was associated with a significantly increased CVR. No differences in CVR were observed with ever or past use of HRT. Continuous length of HRT exposure was associated with a significant increase in CVR. Age and the length of exposure to HRT may be the driving force behind an increase CVR with the use of HRT. Citation: Sibillin, O., et al. (2017). The importance of timing in hormone therapy initiation and cardiovascular risk. Paper presented at the 21st Annual congress of the Australasian Menopause Society, Sydney, Australia, 13-15 October. The objective of this research was to investigate the association between midlife vitamin D deficiency and a decade of depressive symptoms in ageing Australian women. The study found that lower levels of vitamin D were associated with greater depressive symptoms in Australian women aged over 55 years. Citation: Skazlic, L., et al. (2017). Midlife vitamin D deficiency is associated with later-life depression in ageing women. Paper presented at the 23rd World Congress of Neurology, Kyoto, Japan, 16-21 September. The aim of this study was to examine the associations between late-life anxiety symptoms and verbal episodic memory, as well as the associations between cumulative stress from midlife, and late-life verbal episodic memory, in ageing Australian women. Trends were found for increased severity of anxiety, number of hassles and lower verbal episodic memory, as well as for cumulative severity of stress from midlife (over 20 yrs.) and reduced verbal memory performance in late-life. Citation: Goodwill, A., et al (2017). Anxiety and memory performance in older adults: data from the Women's Healthy Ageing Project. Paper presented at the 18th International Mental Health Conference, Gold Coast, Australia, 21-23 August. The study investigated the association between vitamin D deficiency, physical activity, and depressive symptoms over 10 years in ageing women. Those with severe vitamin D deficiency in midlife were at a greater risk of developing depressive symptoms 10 years later, as they were entering later-life. This association was found to be unrelated to physical activity, with women vitamin D deficient at greater risk regardless of their physical activity levels. Citation: Skazlic, L., et al. (2017). Midlife Vitamin D Deficiency is Associated with Depression in Later-Life Women: Data from the Women’s Healthy Ageing Project. Poster presented at the 18th International Mental Health Conference, Gold Coast, Australia, 21-23 August. Despite prevalent mood disorders in the elderly, and particularly in elderly women, limited research has examined depressive symptoms and their effects on cognitive domains. 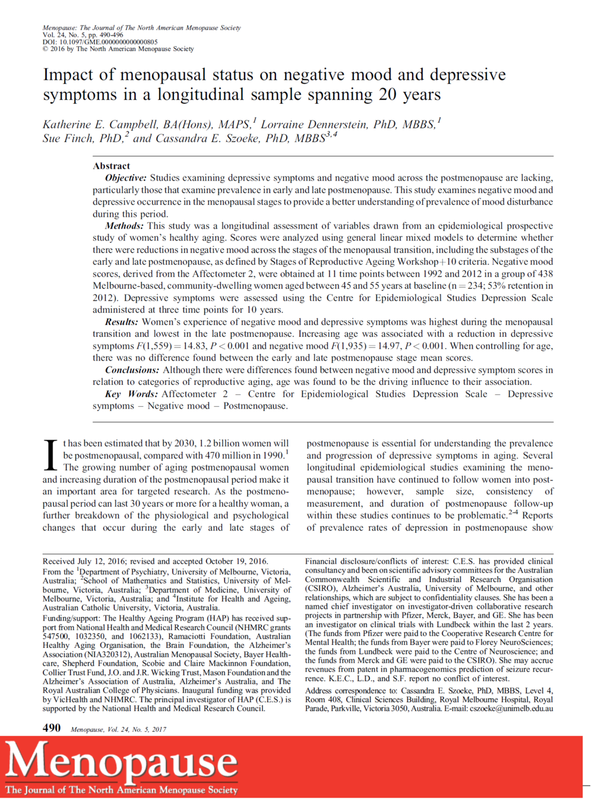 This study aimed to examine the relationship between depressive symptoms and cognitive domains in a cohort of older women. The results indicated that lower depressive symptoms were associated with higher global cognition, verbal episodic memory, and processing speed. Citation: Jamieson, A., et al. (2017). The Effects of Depressive Symptoms on Cognitive Impairment. Poster presented at the 18th International Mental Health Conference, Gold Coast, Australia, 21-23 August. Recent reviews have identified a potential therapeutic window during midlife, where cognitive benefits from statins are more likely. This study investigated the relationship between midlife statin use and late-life cognitive functioning in a cohort of healthy Australian women. The results indicated that women who had taken statins during midlife were more likely than never statin users to exhibit high visuospatial memory recall performance during late-life. Citation: Harding, C.A., et al (2017). The impact of midlife statin use on late-life cognitive functioning in women. Poster presented at the 18th International Mental Health Conference, Gold Coast, Australia, 21-23 August. Previous work has suggested that high endogenous testosterone levels may be detrimental to memory function in older women. The aim of this study was to investigate whether testosterone blood plasma levels influences verbal memory performance in ageing women. In this study, higher levels of testosterone were significantly associated with a lower CERAD delayed recall score, and remained significant after adjustment for age and education. Citation: Termine, M. et al. (2017). Associations Between Endogenous Testosterone and Verbal Memory Performance in Postmenopausal Women. Poster presented at the 18th International Mental Health Conference, Gold Coast, Australia, 21-23 August. The aim of this study was to examine the associations of anxiety, body weight and cardiovascular risk (CVR) in elderly Australian women. Both anxiety and BMI were closely associated with CVR, Elderly Australian women who were overweight or obese were less likely to have severe anxiety. Citation: Li, K. et al. (2017). Associations between Body Mass Index, Anxiety and Cardiovascular Risk in elderly Australian women. Poster presented at the 18th International Mental Health Conference, Gold Coast, Australia, 21-23 August. 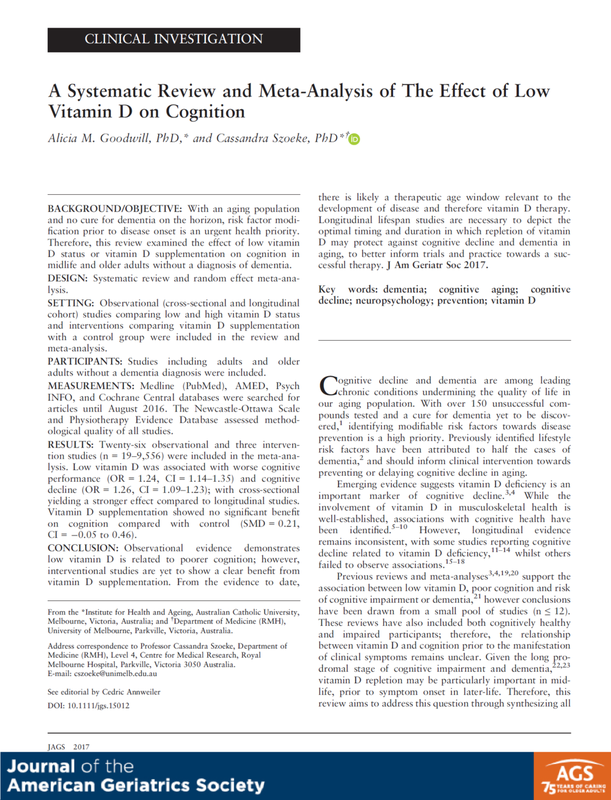 This review examined the effect of low vitamin D status or vitamin D supplementation on cognition in midlife and older adults without a diagnosis of dementia. Medline (PubMed), AMED, Psych INFO, and Cochrane Central databases were searched for articles until August 2016. Observational evidence demonstrates low vitamin D is related to poorer cognition; however, interventional studies are yet to show a clear benefit from vitamin D supplementation. Citation: Goodwill, A.M., et al (2017). A systematic review and meta-analysis of the effect of low vitamin D on cognition. Journal of the American Geriatrics Society, in press, doi: 10.1111/jgs.15012. Family history of dementia impacts dietary inflammatory index scores in healthy ageing Australian women – a case of reverse causality? In this paper, we investigated the impact of familial history of Alzheimer's disease/dementia on dietary inflammatory index scores. To our knowledge, no study has investigated the impact of familial dementia on nutritional patterns. This study found clear evidence for the alteration of nutritional profiles based on familial history after adjusting for confounders. In nutritional research, there is a predilection for dietary choices impacting cognitive decline. These results suggest that an individual’s familial propensity for cognitive decline may be enacting an impact on their dietary choices, irrespective of their APOE-ε4 status. Citation: Hill, E., et al. (2017). Family history of dementia impacts dietary inflammatory index scores in healthy ageing Australian women – a case of reverse causality? Paper presented at Alzheimer's Association International Conference, London, England, 16-20 July. This study hypothesizes that there is an interaction between Subjective memory complaints (SMC), APOE-e4 carriage and memory performance over time. The results indicated that memory performance over time with SMC is mediated by APOE-e4 carriage: individuals in possession of an APOE-e4 allele with reason to believe that they are experiencing memory decline may be at increased risk of developing AD; however, presence of an APOE-e4 allele alone was not associated with memory decline. Citation: Dang, C., et al. (2017). Memory performance over time is mediated by subjective memory complaint and APOE-e4 carriage. Paper presented at Alzheimer's Association International Conference, London, England, 16-20 July. The aim of this study was to investigate the relationship between long-term statin use and late-life cognitive functioning in healthy Australian women aged between 66 and 77. The findings indicate that statin users were more likely to have better verbal-episodic delayed memory performance if they used statins for less than ten years or having taken a defined daily dose of statin of 20mg or less. Citation: Harding, C., et al. (2017). Impact of long-term statin use on cognitive functioning in healthy women from a long-term longitudinal sample: Results from the Women’s Healthy Ageing Project. Poster presented at Alzheimer's Association International Conference, London, England, 16-20 July. Despite the promotion of lifestyle changes aimed to reduce women's risk of vascular disease, this research has found that Australian women do not follow these recommendations. Examining a sample of over 26,000 women, it was found that most women reported low rates of physical activity, fruit and vegetable intake and higher BMI than recommended for good health. Cardiovascular disease (CVD) is the leading cause of death worldwide, with more deaths occurring in women. Early detection of cardiovascular risk (CVR) is essential to cardiovascular research. This research found that the odds of developing high CVR were doubled in overweight women and almost three times greater in obese women compared to women with a healthy BMI. Physical activity also had an effect on CVR, though this was less marked. Citation: Li, K., et al. (2017). Effects of Physical Activity and Body Mass Index on Cardiovascular Risk in Older Australian Women. Paper presented at the 15th World Congress on Public Health, Melbourne, Australia, 3-7 April. Very few studies have investigated the role of MeDi adherence on AD biomarkers such as beta-amyloid (βA). The aim of this study was to examine the impact of individual Mediterranean dietary components on beta-amyloid deposition in a cohort of ageing Australian women. MeDi adherence was not significantly associated with beta-amyloid deposition after adjusting for covariates. Of the MeDi components, greater cereal and legume intake was significantly associated with decreased beta-amyloid deposition after adjusting for covariates. All other MeDi components (vegetable, fruit & nut, dairy, meat, fish, MUFA:SF and alcohol) were not significantly associated with beta-amyloid deposition. Citation: Hill, E., et al. (2017). The role of individual Mediterranean diet components on beta-amyloid deposition in ageing Australian women. Poster presented at 13th International Conference on Alzheimer's & Parkinson's Diseases (AD/PD), Vienna, Austria, 29 March-2 April. Social engagement has been highlighted as a critical protective factor in ageing cognitive health and dementia. This study aimed to examine the unique impact of individual social roles on cognitive function in older Australian women. These results indicate that specific social roles may have differential effects on cognition, with both positive and negative associations demonstrated. These complex associations are lost when examining social engagement as a sum variable. Citation: Burn, K., et al. (2017). Not all social engagement is equal: Impact of social roles on cognitive performance in older women. Poster presented at 13th International Conference on Alzheimer's & Parkinson's Diseases (AD/PD), Vienna, Austria, 29 March-2 April. DIFFERENT NORMATIVE DISTRIBUTIONS OF COGNITIVE PERFORMANCE BETWEEN HEALTHY OLDERS AND COGNITIVELY IMPAIRED OLDERS – BUT WHAT ABOUT THE GREY AREA? each method of standardization, ranging from 30–36%. This study describes the diagnostic “grey area” where comparatively poor cognitive performance can be normative or can be due to underlying pathology. This distinction has important clinical and diagnostic implications. Citation: Dang, C., et al. (2017). Different normative distributions of cognitive performance between healthy olders and cognitively impaired olders – but what about the grey area? Poster presented at 13th International Conference on Alzheimer's & Parkinson's Diseases (AD/PD), Vienna, Austria, 29 March-2 April. A growing body of research has found that dietary patterns, such as the Mediterranean Diet (MeDi) exhibit neuroprotective effects. Many studies have examined MeDi in impaired or diseased populations, with a subsequent paucity of findings from healthy or prodromal individuals. Furthermore, few studies investigate female only populations who are more at risk of AD and dementia. This study investigated the impact of MeDi adherence on Full Scale IQ (FSIQ) in a healthy cohort of ageing Australian women. MeDi adherence was significantly associated with FSIQ, accounting for all covariates. Increasing MeDi adherence by three points (on 18 point scale) was associated with a two-point increase in FSIQ. Citation: Hill, E., et al. (2017). The effect of Mediterranean diet adherence on Full Scale IQ. Poster presented at the International Convention of Psychological Science, Vienna, Austria, 23-25 March. Social engagement promotes psychological health in ageing, with greater engagement shown to be associated with better mood and lower risk of depression. Most studies in this area only focus on one or two roles. As many older adults engage in multiple roles, studying multiple roles allows for the consideration of unique and interaction effects. This study investigated the effects of individual social roles on mood in older Australian women. The results indicated that individual social roles have differential effects on depressive symptoms, anxiety symptoms, and daily stress. Citation: Burn, K., et al. (2017). Impact of individual social roles on mood in older women. Poster presented at the International Convention of Psychological Science, Vienna, Austria, 23-25 March. This review discusses research on the relationship between marital status and health, including the differences in effect due to gender. The authors note that future research must consider the changes in who can marry, cohabitation patterns, and roles within relationships that have occurred over the recent decades. Few studies have examined the changes in negative mood and depressive symptoms reported during menopause and postmenopause. This study reports that while these symptoms are highest during the menopausal transition and lowest during post menopause, age was more strongly associated with mood disturbance than menopausal status. This research examined the change in reported depressive symptoms and negative mood in women over time. Negative mood was assessed over a 20 year period (commencing when the women were aged 45 to 55 years), with the depressive symptoms measured for 10 years (starting from age 55 to 65 years). Both depressive symptoms and negative mood were found to decrease significantly from mid-life to late-life. In spite of grand-parenting being the most common form of non-parental care, there has been a limited amount of research regarding the impact of grand-parenting on the health of ageing women. This editorial discusses previous research regarding grandparenting and health, and areas for future research. This research examining the impact and timing of modifiable risk factors on memory performance in women from midlife to later life, over a period of 20 years (from 45-55 years). Greater physical activity and and HDL cholesterol levels had a positive effect on verbal memory performance in later life, with hypertension having a negative effect. These factors were found to have a cumulative effect, showing that a life-course approach to interventions for memory are warranted. Projections indicate that by 2022 Alzheimer’s disease and dementia will overtake heart disease as the leading cause of death in Australia (ABS). Modifiable risk factors have the best chance of reducing the burden of dementia. There is a lack of information on alcohol exposure in the pathological changes associated with AD, most notably amyloid accrual. This study found that increased alcohol consumption was associated with decreasing amyloid accrual. This relationship appeared driven by APOE-E4 as a significant negative association with amyloid accrual was seen in those with the APOE-E4 allele but not in those without. Physical inactivity and high BMI are major risk factors impacting cardiovascular diseases, particularly in women. There is a paucity in longitudinal research into the interactions between exercise and BMI that could lead to high cardiovascular risks (CVRs) in women. This study found that as the mean frequency of exercise increases, the mean BMI decreases and CVR increases for women in midlife. The effects of regular exercise decrease both CVR and BMI . However, lowering BMI levels alone does not reduce CVR. Australian morbidity rates for cardiovascular disease are higher in women than for men, however, this trend only appears after the menopausal transition. These results demonstrated that there was a significant correlation between high testosterone levels and increased cardiovascular risk. Estrogen showed no significant correlation with cardiovascular risk. The aim of this study was to investigate the relation between various lipid profile measurements and cardiovascular risk in a cohort of older Australian women. The results indicated that the most relevant lipid measurements were HDL and Triglycerides in relation to cardiovascular risk. HDL and triglycerides provide a potentially more appropriate focus of primary health care than cholesterol as a whole.